M10A Lord of hosts [Jehovah Sabaoth] | GOD Who Are You? AND Who Am I? This whole Bible study explores twelve of the more prominent attributes of God that help us understand who He is. This one module addresses twelve attributes the Church must possess if she is to overcome and be given the “right to sit with [Jesus] on [His] throne, just as [He] overcame and sat down with [His] Father on his throne” (Rev. 3:21). “From this it is implicit that a godly ‘romance’ is at the heart of the universe and is the key to all existence. From all eternity God purposed that at some time in the future His Son should have an Eternal Companion, described by John the Revelator as “the bride, the Lamb’s wife” (See Rev. 21:9). We will be His Eternal Companion. In this module we will use the term bride—from the female point of view. The bride defined in Webster’s is a woman just married or about to be married; bridegroom defined the same way. Sometime in the near future Jesus will come for His mature Bride. He does not want to marry an immature child, so He is willing to wait until she grows up. He is looking for those who have learned to overcome in His strength and power; thus, expressing His love— becoming as He is in this world. This Bride exhibits an unshakable faith and determination as fulltime encouragers who worship and praise Him. He is looking for totally committed persons willing to spend time to know His mind through His Word. He is looking for—in the same persons—those who have dropped all excess baggage so they can fight the battles in the Promised Land Plan, and those whose trust—in Him and for one another—has matured. He is looking for those who have learned to respond rather than react, who communicate with Him about absolutely everything—including money—never trying to hide anything from Him. They cannot anyway. Their hearts are exposed so His love can flow through His royal red blood in them, reaching out to others. This prayer of Jesus is no less than the traditional marriage pronouncement a minister gives the bride and groom after they have made their covenant vows of commitment. He says to them from Matthew 19:6, “‘[You] are no longer two but one flesh. What therefore, God has joined together, let man not separate’” (NASB). We have been made one in Jesus who was one in His Father through the Holy Spirit. He has given us His name in holy matrimony and is responsible for us, protecting us through the power of His name. He bought us for Himself with a great price by dying for us. He put a ring on our finger—a seal on our foreheads—“having this seal the Lord knows those who are His” (2 Tim. 2:19; see also Rev. 9:4). What does this mature bride look like who is still in the world—who proudly wears His ring and identifies with His name so that the world may believe? Three women, Barbara Watts, Pat Jessee, and Jo Anne Swezey, exhibit all the twelve attributes of the mature Bride. Although their stories are told in this chapter, it does not take away from the significance of other stories in this book. All are fully committed overcomers and reflect these values as well. These three women’s testimonies possess certain qualities in a more pronounced and easily discernable manner. However, before we look more specifically at the Bride, we need to understand just who Jehovah-Sabaoth is—the Lord of hosts. Who is Jehovah Sabaoth [Lord or hosts]? Lord of hosts is husband to Israel and to us—as adopted Gentile believers. 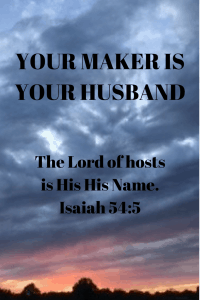 The Hebrew word for husband (bâal) means – “to be master, to rule, possess, marry, to be married, to be taken as a wife.” This is a verb, occurring more than 100 times in the O.T. God is the husband to Israel (see Isa. 54:5, Jer. 3:14, Jer. 31:32, and Mal 2:ll). The land of Israel is “married” (bâal) to Jehovah in the Book of Isaiah (see Isa. 62:4). This is similar to the relationship between Christ as husband of His people, known as the ekklesia (Eph. 5:21, “be subject to one another in the fear of Christ”). There is a covenantal tie of love and loyalty between God and His people. He has dominion over us (see Isa. 62:4). Lord of hosts is our bridegroom. Matthew, Chapter 25, tells the parable of the ten virgins who took their lamps and went out to meet their bridegroom. Five of the maidens’ lamps went out and they wanted the other five to give them their oil. They were told to go purchase their own. “And while they were going away to make their own purchase, the bridegroom came, and those who were ready went in with him to the wedding feast; and the door was shut” (Matt. 25:10). When the five finally arrived and banged on the door to get in, the bridegroom said, “Truly, I say to you, I do not know you” (vs. 12). Lord of hosts is Supreme Commander of Israel and the universe—ready to intervene. Host means, tsâbâ’, “The basic meaning is service done for a superior, usually military service . . . . Although the title of tsâbâ’ had military overtones, it pointed directly to Jehovah’s rulership over the entire universe. He stands ready to intervene for His people at any moment.” The Lord of hosts took David from among the sheep to rule over His people Israel (see 2 Sam. 7: 8). He did this by working through David who killed the giant Goliath saying, “You come to me with a sword, a spear, and a javelin, but I come to you in the name of the Lord of hosts, the God of the armies of Israel, whom you have taunted” (1 Sam. 17:45 NASB); thus, the Lord of hosts intervened for Israel in defeating the Philistines through one willing vessel—David. Psalm 110:3 speaks of people who will volunteer freely in the day of His power—as in military service of the Lord. He is the King of Glory. Psalm 24 is a beautiful picture of the Lord of hosts as mighty in battle. Who can stand before Him? Only those who have clean hands and a pure heart, who have not lifted themselves up to what is false. Lift up your heads, so the King of glory may come in. “Who is this King of glory? The Lord of hosts, He is the King of glory” (Ps. 24:10 NASB). 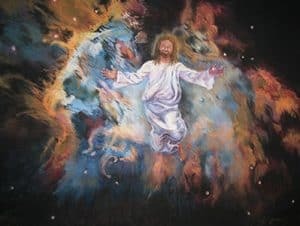 The queen, who will share the King’s throne and His glory, has faced Truth and is living before Him with clean hands and a pure heart, right now, along with those who have already gone before. Paul E. Billheimer, Destined for the Throne (Minneapolis, Bethany House, 1975) p. 22. In the Greek Dictionary of the New Testament found in Strong’s Exhaustive Concordance, seal means “to stamp for security and preservation; impressed as a mark of privacy, or genuineness,” p. 70. Spiros Zodiates, Th.D., Executive Editor, The Hebrew-Greek Key Word Study Bible, (AMG Publishers, Chattanooga, TN 1990) p. 1716. Previous PostM9H Our Balance Story: Kicked Out of the SaltshakerNext PostM10B What Does the Mature Bride Look Like?